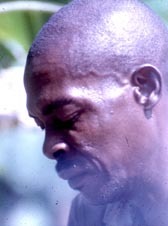 When he buys the palm tree from the farmer who grew it, the first thing the tapper does is to cut it down by digging under the main root. 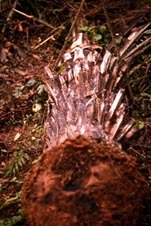 A fallen oil palm tree ready for the tapper. The tapper then visits his string of palm trees every morning. 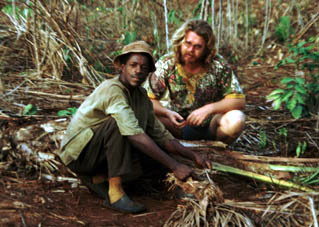 Meet your friendly local author here with a friend who is a palm wine tapper. In the sixties and seventies long hair and round glasses were popular. The palm tree has been felled by digging around its roots and, while it lies on its side, the tapper comes to it every morning. All the tappers I have asked say that a tree provides sap for wine for about six weeks. I am rather intrigued by the mention of six weeks, for that means adaduanan, the Forty Days of the traditional calendar, and I suspect that it is used rather like we use the word "month" to estimate a period of time, even if not so accurate. 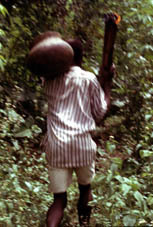 Ghanaian tappers look down upon those in Nigeria who tap the trees while still standing. The Ghanaians think the Nigerians are stingy and try to get more sap out of a tree, but they sacrifice the better taste that comes from cutting down the tree. 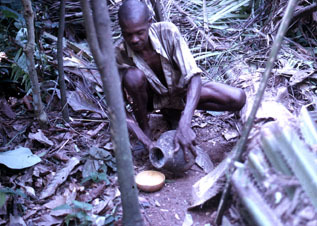 Pouring the sap from the small pot under the tree to the large collecting pot. 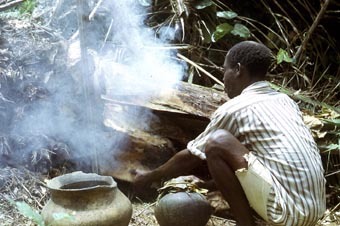 The first task at each tree is to collect the sap which has gathered inside the tree, and dripped into a small pot the previous day and overnight. He will return the small pot to its place under the tree, and leave with the larger pot after he collects the sap from all the trees on his string. Here you can see the large hole on the top side of the fallen palm tree, where the tapper has parked his burning bunch of dried palm branches. The straw in his mouth is what he will use to heat up the burning bunch of branches, much like a blacksmith will blow air onto the charcoal to heat up his smithy fire. 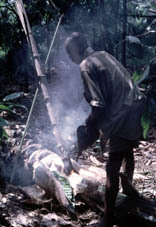 Heating the burning bundle of palm branches using a bellows. 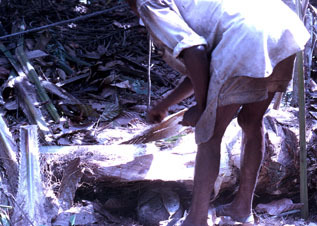 After removing the sap, the tapper then heats up his bunch of dried palm branches inside the larger hole on the top side of the fallen oil palm tree. The tapper may use bellows (like those of a blacksmith) as above, or his straw, as below. This scalds the bottom and sides of the hole so that sap collecting inside it will not run out again through the pores of the trunk. 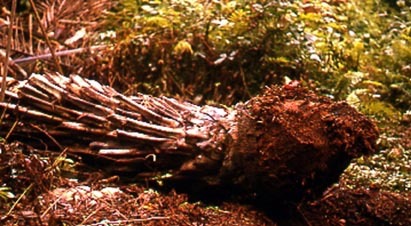 It should run into a smaller hole down to the bottom of the fallen trunk, and into the small pot which will be left to collect sap from the next twenty four hours. 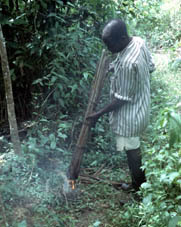 Heating the burning bundle of palm branches using a blowing straw. 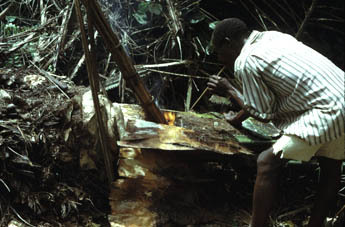 After cauterizing the bottom and all four sides of the catchment hole, the tapper must then remove the burned surface of the side which is highest, allowing the sap to flow into the hole. Scraping the scald off the higher end of the collecting hole. This is a top view of the hole on the top side of the fallen trunk. 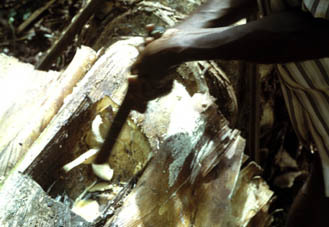 After the tapper scalds the bottom and sides of the hole, he must cut a thin slice off the side on the higher end of the hole so that the sap still inside the trunk will flow into the hole. 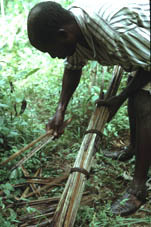 At various times over the six weeks, the tapper will put the top or bottom of the tree slightly higher, so that the sap will run into the hole from both ends in turn. To the right of the hole in this photo, hanging onto the side of the trunk, you will see parts of the "bark" or outer part of the trunk. It is folded over the hole, so that rain, small animals and insects will not get inside it over the next 24 hours. The sap is an interesting chemical. No known treatment has yet been discovered to stop the fermentation process. Putting the sap into sealed bottles only produces explosions when the pressure builds up inside those bottles. The sap is very sweet and contains little alcohol in the morning when it is first taken from the tree. It is popular in that form, for when we take some rock salt and perhaps some hot chilli peppers, one can drink a large calabash of the unfermented sap. It then continues to ferment throughout the day, bypasses the digestive system, and goes directly into the blood stream, providing a steady source of energy, and removes the necessity of eating during the day. 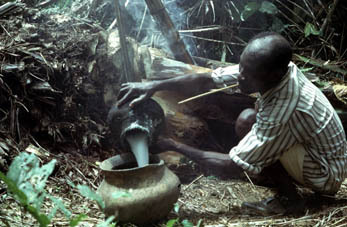 Both men and women drink palm wine, but it is popular with men who have a heavy day of clearing rough bush for the farms. See pictures of how it is marketed.